Legumes are plants with seeds in pods. They include beans, peas, lentils, peanuts and soybeans. Legumes have been a major source of protein in the diet for more than 5000 years, according to the University of Minnesota Extension. In addition to protein, legumes are also high in fiber, micronutrients and phytochemicals. Despite the nutritional benefits, western cultures limit the use of legumes in their diets. Canned and dried beans can be found in any supermarket. They are high in soluble and insoluble fiber and contain healthy fats, according to MayoClinic.com. They have a low glycemic index, meaning they do not cause spikes in blood sugar, and are good choices for diabetics. Examples of beans include adzuki beans, black beans, black-eyed peas, chickpeas, fava beans, lima beans, kidney beans, and pinto beans. Beans can be added to soups, stews, salads, and casseroles. 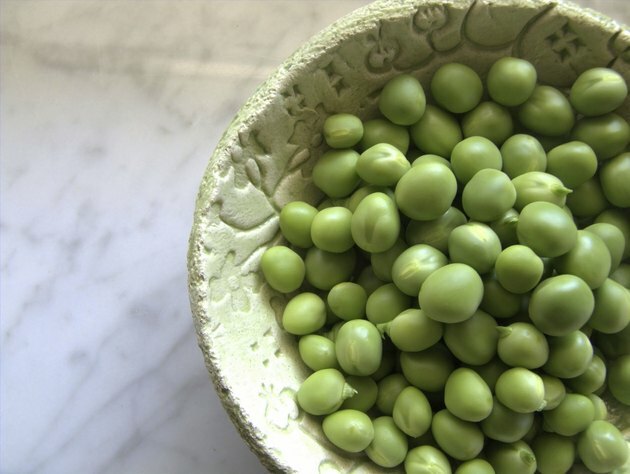 Green peas are the most commonly known pea. They are widely available fresh, canned and frozen. Peas are also available dried, in whole or split form. A half-cup serving of cooked split peas contains 143 calories and boasts 8 grams of fiber. They are also an excellent source of vitamin A, folate, thiamin, iron and phosphorous. In addition to being used as a side dish, peas can be added to soups, rice dishes, pasta, omelets, salads, and risotto. Lentils do not require soaking and take 30 minutes to prepare. Lentils come in a variety of colors, including green, brown, red and orange and are either split or whole. They contain 113 calories per half-cup serving, and boast 8 grams of fiber. Lentils are an excellent source of folate. They make a great side dish and can be added to salads and rice dishes. Although peanuts are legumes, their nutritional make-up is more similar to tree nuts than to legumes, according to the Linus Pauling Institute. Peanuts are higher in fat. The fat in peanuts is monounsaturated and polyunsaturated. Peanuts are also high in vitamin E. Peanuts can be eaten as a snack or added to stir-fry and salad recipes. Each ounce contains 161 calories and boosts your fiber intake by 2.4 grams. The protein in soybeans is nutritionally equivalent to the protein in meats, making it a meat alternative. Soybeans can be found dried and fresh, and boast 150 calories and 5 grams of fiber per serving. Soybeans are unique legumes because they are a concentrated source of isoflavones, says Mark Messina author of "Legumes and Soybeans: Overview of Their Nutritional Profiles and Health Effects." Isoflavones may play a role in cancer prevention, osteoporosis and heart disease. Soybeans can be added to soups, casseroles and salads. Fresh soybeans can also be eaten as a snack.